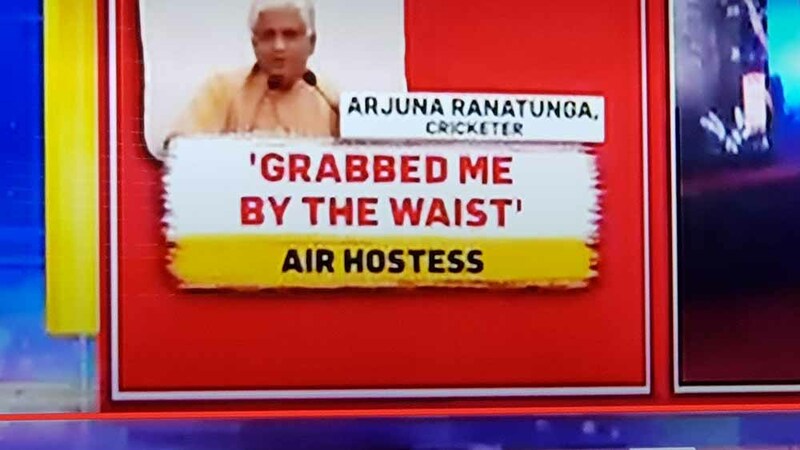 (Lanka e News -15.Oct.2018, 4.45AM) Former Sri Lanka cricket captain Arjuna Ranatunge and currently minister of Petroleum committed sexual molestation on her , alleged an Indian airline stewardess. She made this startling revelation to a television channel of that country. Arjuna’s name was dragged in while Bollywood actress Thanu Sri Dhatta made a controversial revelation . Thanu Sri Dhatta made a confession recently that several Bolywood actors and producers raped her every now and then . While the mass media were publicizing this and having public discussions , a number of women who were victims of sexual abuse of famous individuals too came forward to expose their own sufferings . It is then one Air hostess of the Indian airlines divulged that Arjuna committed sexual abuse on her. He held her by the hips, forcibly drew her towards him and fondled her breasts , the stewardess had stated in her confession.